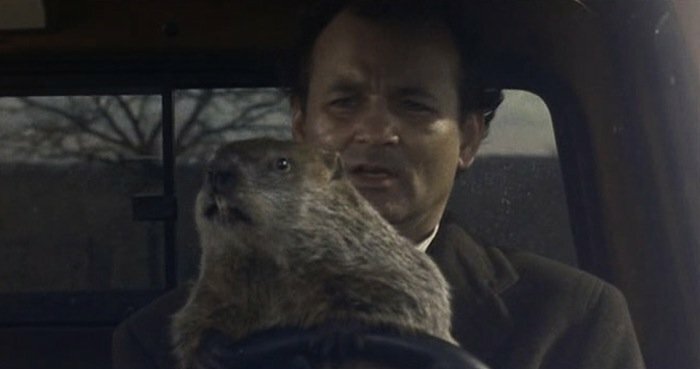 That’s the lesson of the Bill Murray movie, eponymous to the name of yesterday’s Punxsutawney festivities. The movie is now 20 years old, and still has an 8.1 ranking at IMDB from nearly a quarter million users. Watching the movie is a ritual now, like “Elf” or “A Christmas Story” at Christmas, and I daresay as many watched the movie as were in the Pennsylvania town watching the groundhog. And I was one. be, or even where you want to be, but that has nothing to do with your future. To put it as lightly as possible, this is false. Also wrong. And harmful. I get how it’s about encouraging, about how no matter what you’ve done, it can be overcome. You can change. In that kind of situation, the sheer (apparent) hopelessness itself can work against the desire and any effort to act. In it’s lowest application, it can simply be used as an excuse for not acting. Here though, the aphoristic encouragement crosses the line. It works against its avowed goal — because it won’t encourage one who, not long after taking the advice, finds his past matters a great deal. Which is everyone. Our pasts don’t preclude progress. They don’t make change impossible. Won’t have final say on whether or not. But what we’ve done matters. Our “past” is our life, everything up to just a second ago. It’s all things, and in this context, mainly the bad stuff: the habits we’ve formed, the lies we’ve told, the people we’ve hurt. Realizing we’re wrong, and saying so, clears the slate; it doesn’t remove the effects. It’s a start. A Start. Not a finish, save in the sense of saying I’m done with all that. But alcoholic women and angry men still have to “make amends,” as some traditions say. They still have to do something. Even if that something turns out to be a kind of nothing, as other traditions say. When we tell people their pasts won’t affect efforts to change in the future, and they learn it’s not true — that habits must be reformed, that truths must triumph, that people won’t (yet?) trust them — they’ll be more discouraged than ever. Or we’ll blame others for not playing, creating a whole ‘nother pile of rotten for the one we think we’ve fled. We may find a way — as Phil Connors does in “Groundhog Day” — for our past to stop defining our future. Then again, we may not. It took him years of repeating the same day over and over to change. We won’t get there by pretending our pasts don’t exist. This is the title essay of the collection found here.